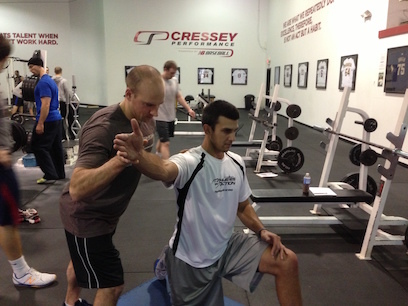 Here's an exercise we came up with this offseason in the middle of a training session with NL Cy Young Award Winner Max Scherzer of the Nationals - and it quickly became a "keeper" for his programs moving forward. Max has gotten pretty strong with lateral lunges, and the kettlebell/dumbbell goblet set-up doesn't work all that well once you're past an appreciable amount of weight. Likewise, holding the weight between the legs drives a more kyphotic (rounded shoulders) posture and can limit range-of-motion. Enter the landmine lateral lunge, a great option for getting strong outside the sagittal plane. 1. Sit back into the hip without the toes lifting up. 2. Keep the head/neck in neutral. 3. Make sure you're wearing shoes with good lateral support so that you aren't rolling over the sides.